PINE BLUFF – Black lights and phosphorescent fish – throw in your standard mod Peter Max poster, some Hendrix on the turntable and maybe a lava lamp, and it would seem like someone’s living room circa 1970. However, more than four decades later, black lights are less a living room showpiece and more useful in the hands of biologists looking for “glowing” crappie to determine how effective a pond-stocking program can be. As part of a grant administered by the Arkansas Game and Fish Commission, Greyson Farris, a master’s student in the aquaculture program at the University of Arkansas at Pine Bluff, is studying the AGFC’s crappie stocking program using fingerlings from two hatcheries: the Joe Hogan hatchery at Lonoke and the William H. Donham hatchery in Corning. Late in the fall of the past two years, about 180,000 fingerlings – half of them white crappie from Lonoke and the other half black crappie from Corning – were treated with chemicals that allow researchers to track the fish after stocking in eight Arkansas lakes, according to JJ Gladden, a biologist at the Lonoke facility. During the first year, the fish were marked with the U.S. Department of Agriculture-approved oxytetracycline, or OTC, in which the fingerlings absorb in a six-hour bath. The chemical is absorbed in bony areas such as the ear bone. Last fall, the fish were also treated with OTC, but Farris then used another marking agent, calcein, a phosphorescent dye, in another, shorter treatment before the fingerlings were taken for stocking. The key difference between using calcein over OTC is that fish tested for the presence of the marker do not have to be sacrificed in the process. Fish captured for testing that were marked with only OTC have to be cut open for their ear bone, or otolith, to be examined under special light. The nature of calcein, Farris says, is that it’s absorbed not only in the bones but in the fins, around the eyes and mouths, and it offers a vivid green appearance when seen under black light and with specific glasses. Using the calcein as a marker required the AGFC to request a special license from the U.S. Fish and Wildlife Service, but the process for marking the fish was far easier, Farris said. Instead of a six-hour soak in OTC, the fingerlings were hit with a 30-second bath of salinized water (about 40 parts per 1,000, he said), a fresh water rinse, then a seven-minute soak in the calcein-water mixture. The salt water bath drew out most of the water from the fingerlings – making them “sponge-like,” Farris said – which then soaked up the calcein. OTC is a proven method in marking fish, in use for more than 40 years, Farris said. The question is, how long will the calcein last in a crappie? Farris said calcein in fish has been shown to degrade over time in sunlight. However, crappie tend to stay deeper in lakes and the fish’s nature is to not turn on its side; the underbelly of the crappie should be least likely to see much if any photodegradation, Farris said. And in fish he’s tested both at UAPB and in pond nettings, he’s found calcein. Calcein marking costs more, about $5,000 to mark 90,000 fish compared to $1,000 for OTC. But the tested fish live. And, “any measure of a stocking program is a measure of success,” Farris notes. Because of warmer autumns the past two years, the fingerlings weren’t ready for the treatment and stocking until November. Farris tested the lakes through the winter and said he will resume through the summer and fall, netting about 250 crappie per lake to find if they were part of the stockings. “The objective was to find a way to look at these fish without having to kill them, stock them, see them in the nets with [black lights] and see if they were the fish we stocked,” Farris said. This entry was posted in Conservation, Crappie Fishing on May 29, 2016 by ronniegarrison. Springfield, Mo. – More than 25 of the country’s leading conservation organizations are contributing to the creation of one of the largest, most immersive conservation attractions in the world. Scheduled to open in Springfield, Missouri in 2016, Wonders of Wildlife National Museum and Aquarium will celebrate the critical role responsible hunting and fishing play in conserving the great outdoors. A vision of leading conservationist and Bass Pro Shops founder/CEO Johnny Morris, the 315,000-square-foot experience is intended to inspire future generations to enjoy, love and conserve the great outdoors. To help shape the attraction’s educational message and story, Morris convened a “who’s who” of conservation leaders in America. With expertise ranging from wetlands and waterfowl to coastal waters and international wildlife efforts, leading national conservation groups are collaborating to help tell the untold stories of the conservation movement in the United States and showcasing their worldwide impact. Consisting of leaders from both nonprofit and government entities, the nationwide collaboration hopes to establish a new conservation capital that highlights past successes and shares important conservation messages with a national audience. Morris first convened the leaders at a National Conservation Summit held in Springfield in late 2015. The gathering brought together more than 40 national conservation leaders to discuss fun and engaging ways to inspire the public to appreciate and protect wildlife and natural habitats. For example, the museum will become the new permanent home for The Boone and Crockett Club’s world-famous National Collection of Heads and Horns. The exhibit gives visitors a chance to see more than 40 historically significant North American game animals that helped spark America’s conservation movement when it debuted at New York’s Bronx Zoo in 1922. Additionally, The International Game Fish Association’s interactive Fishing Hall of Fame is relocating to the aquarium from the IGFA’s headquarters in Florida. The exhibit tells the stories of some of the sport’s most accomplished men and women. Nearby, The National Archery Hall of Fame seeks to preserve the sport’s history and tradition with more than 1,500 artifacts including a handmade bow made by the Native American Apache leader Geronimo. By honoring the outstanding men and women in the sport, the experience sends a message that anyone can enjoy archery as a gateway to appreciating the outdoors. The NRA National Sporting Arms Museum showcases the development and evolution of hunting arms in America from colonial times to today. This educational gallery is one of the premier sporting arms museums in the world. Home to nearly one thousand artifacts the gallery tells the story of American icons such as Lewis and Clark and Theodore Roosevelt. The result of these collaborations is a bold new attraction that leaves visitors with a powerful conservation message. Wonders of Wildlife is envisioned to be unlike anything else in the world. Inside the immersive aquarium adventure, visitors will encounter sharks, rays, jellyfish, eel, otters, turtles, sport fish and countless game fish such as largemouth bass and catfish as they travel through an elaborate trail system of distinct aquatic habitats, discovering hands-on activities that celebrate the diversity of all aquatic life, including incredible sport fish. The entire aquarium experience highlights the need to conserve these beautiful ecosystems and the animals that live there. Completely immersive wildlife galleries transport visitors to the wildest places on earth through meticulously recreated 4D dioramas that include the realistic sights, sounds and smells of awe-inspiring habitats from North America, Africa and the Arctic. The experience will celebrate the vital contributions of sportsmen and women to wildlife conservation and engages leading conservation partners to showcase important success stories and ongoing efforts. The new experience is located adjacent to Bass Pro Shops’ iconic flagship store in Springfield, Missouri’s number one tourist destination that already welcomes four million visitors per year and further establishes Johnny Morris’ vision of creating America’s Conservation Capital and a new must-see destination for everyone who loves the outdoors. Scheduled to open in 2016, the all-new Wonders of Wildlife National Museum and Aquarium will be one of the largest, most immersive conservation attractions in the world. Primarily funded and operated by the nonprofit Johnny Morris Foundation, Wonders of Wildlife consists of an all-new 1.3-million-gallon aquarium adventure showcasing 35,000 live fish, mammals, reptiles and birds, and an immersive wildlife museum that brings visitors eye-to-eye with the greatest collection of record-setting game animals ever assembled. The 315,000-square foot experience celebrates the critical role responsible hunting and fishing plays in wildlife conservation and inspires visitors to enjoy, love and conserve the great outdoors. Located on the campus of Bass Pro Shops’ iconic flagship store in Springfield, Missouri, Wonders of Wildlife further establishes the site as America’s Conservation Capital. For more information visit www.wondersofwildlife.org. This entry was posted in Conservation on May 28, 2016 by ronniegarrison. Last week 14 members of the Potato Creek Bassmasters fished our May tournament at Lake Hartwell. During the tournament fished on Friday and Saturday, 93 keeper bass weighing about 150 pounds were brought to the scales. Kwong Yu won with ten weighing 21.85, Niles Murry was second with ten at 19.46 and his 5.50 pound largemouth was big fish, Lee Hancock had nine at 18.36 for third and Ryan Edge’s ten weighing 16.92 pounds for fourth. It was a very frustrating bass tournament at Lake Hartwell for me. I went to Hartwell on Tuesday and got a campsite at the local KOA and set up for the next few nights. Wednesday morning I was on the water before daylight. I knew the best pattern this time of year on Hartwell was to make long casts with a big topwater plug over shallow points and humps to catch bass feeding on blueback herring. The first point I fished made me know I would not be able to fish that pattern. I cast a Gunfish, a topwater plug that imitates a bass feeding on herring that you have to twitch constantly. Within 15 minutes my wrist and shoulder ached so badly I had to quit. 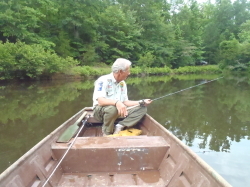 Its tough when you get too old to fish the way you want, but I always said I would rather wear out that rust out. I spent that whole day trying to catch fish on a slow moving bait that would not hurt so much to fish. After ten hours I had landed exactly one keeper and half dozen bass shorter than the 12 inch size limit. I couldn’t even catch fish off docks, usually a good pattern in a clear lake like Hartwell. Wednesday I had spent a lot of time looking for bedding bream or bass bedding late in the year, but found none. So Thursday I changed tactics. I started out on a bridge where herring and shad usually spawn, and those baitfish were all over the rocks and pilings, and I could see nice three to four pound bass cruising under them in the shade around the pilings, but I could not get then to hit. So I went looking for stained water, going way back in some creeks where rain had made the water less clear. Some places looked great. In one I had to go through a culvert just high enough for my boat seats and windshield to get under it. Just as I started under it I remembered my back running light was still plugged in and I looked back just in time to see it hit and bend over, breaking it. Fortunately, a local store had a replacement that afternoon. That stupid mistake cost me only $40! Back in that creek I thought I had found the perfect place. I knew a lot of bass fishermen would not try to get back there through the culvert and the water had a good color. I could see my spinnerbait down only a foot or so. And there was grass, button bushes, docks and brush piles all around the big area above the culvert. I spent several hours in there fishing different but never caught a keeper. So Friday morning I ran to the bridge, hoping some of those bass I had seen would bite at first light, and one good keeper did hit a topwater plug. After three hours I gave up and tried to fish topwater but gave up from the pain. My only hope left was a small creek where I have caught fish in the past. I ran to it and managed to catch two more keepers to give me three for the day. Friday I went straight to that creek and stayed in it all day and did manage to catch a limit, but the five weighed only 6.1 pounds, not nearly enough to do any good! This entry was posted in Bass Fishing, Tournament Fishing on May 27, 2016 by ronniegarrison. There is no question that the passage of the Marine Life Protection Act (MLPA) has been the most controversial environmental issue California’s angling community has ever faced. It signaled the state’s shift from a shared philosophy of conserving California’s natural resources to outright protectionism, with little regard to the interests of outdoor recreation, tourism and all of their economic benefits. As the MLPA established the framework for Marine Protected Areas (MPAs), the state promised California anglers that areas designated as off-limits to commercial and recreational fishing may one day be open to fishing. In fact, they were very specific in their promises. Scientific assessments would be conducted every five years, and as fish populations were assessed as sustainably viable, the restrictions would be lifted. Over time, the state established many MPAs along California’s coastline, totaling over 850 square miles. As new MPAs were introduced, the angling community not only challenged the merits of closing some prime fishing spots, but the process by which they were selected. The locations and boundaries were not set by a presumably objective government agency, rather, a private organization who’s funding was fueled by environmental groups, many of which shared an anti-fishing agenda. As the plans came before the California Fish and Game Commission, the science or lack thereof was challenged, but to no avail. Even with considerable restrictions on the amount and manner of take already in place, commissioners simply assured anglers that timely assessments would be conducted and such drastic action would only lead to more plentiful fishing in the years to come. That was then and not now. Deadlines to conduct these assessments have come and gone, and so apparently have assurances that the state can keep its word. This was evident at the April 13 California Fish and Game Commission, where some commissioners echoed the view of environmentalists that no promises were ever made. In fact, the president of commission stated that he didn’t expect fishing to be restored during his lifetime. In retrospect, this stunning pronouncement was not surprising. At the April meeting, the commission was functioning with only three commissioners and two vacancies after several longstanding commissioners resigned out of frustration. Defending hunters and anglers had become too tiresome. Ironically, it was the two recently appointed commissioners who challenged the assertion that promises were made, as if they had an institutional knowledge of the all the public hearings and stakeholder meetings. The bottom line is the state did not recruit recreational anglers to serve on stakeholder groups to seek their advice on how best to deny them access to some of California’s finest fishing, permanently. That would have been a none-starter. Rather, stakeholders were assured that environmental mitigation was required to protect the ocean’s natural resources, and their participation aimed to balance the interests of responsible environmental stewardship and outdoor recreation. The commission would be wise to abandon their current course of action of denying the truth, thereby enshrining the Marine Life Protection Act’s legacy as the greatest bait and switch act ever. It will only further damage their relationship with those who were once their partners in conserving our state’s natural resources. What’s more, their actions have economic consequences. Recreational fishing contributes over $4.9 billion in economic activity each year, and its economic value will only decrease as the state continues to deny access to some of the nation’s finest fishing. Marko Mlikotin is the executive director of the California Sportfishing League, California’s leading advocate for anglers and businesses dependent on outdoor recreation. This entry was posted in Conservation on May 26, 2016 by ronniegarrison. Last Thursday I drove to Lake Weiss near Rome, Georgia to get information for my July Georgia and Alabama Outdoor News magazine article. Since this is a border lake, with most of the lake in Alabama but some in Georgia, and many Georgia bass fishermen go there, it will be in both issues. You do have to have an Alabama fishing license to fish the lake. I met Wayne Boyd, a tournament fisherman from Rome that knows the lake well, at the boat ramp at 9:00 AM. We fished grass beds for two hours and he caught two nice largemouth about five pounds each on a chatterbait. This pattern will not work well in July so we then spent two hours looking at spots that will be good in July, although bass have not really moved to them yet. Weiss is a very pretty 30,200 acre lake on the Coosa, Chattooga and Little Rivers that has an average depth of only ten feet. That surprised me when I first went there years ago. The lake is surrounded by low mountains and I thought it would be deep and clear like most mountain lakes, but it is shallow, stained most of the year, and full of grass beds and wood cover to fish. Since Weiss is on the Coosa River it has a good population of those hard fighting Alabama or Coosa spotted bass. It also has a good population of largemouth bass but the lake is known as “The Crappie Capital” of the world. There is a ten inch size limit on crappie there but fishermen still fill their limits, even with those nice fish. If you want a good trip to catch bass or crappie, a trip to Weiss in June would be a good choice. This entry was posted in Bass Fishing, Where To Fish on May 25, 2016 by ronniegarrison. Whenever you’re fishing a lake you’ve never been on before, look for cover or structure that lets you fish your favorite lure and technique and gives you confidence. That’s the advice of Yamaha Pro Randall Tharp, who followed it without hesitation in winning his first Bassmaster® Elite tournament on not one but two lakes he’d never fished before. “The biggest factor in my win was that I just had a lot of confidence in the technique I was using and the area I was fishing,” explains Tharp in describing his victory at Bull Shoals and Norfolk Lakes in Arkansas where he weighed in 61 pounds, 10 ounces of bass while competing two days on each body of water. “I had fished other Ozark lakes over the years,” the Yamaha Pro continues, “and they’re all somewhat similar in the way they look and the way they fish. I also studied how another fisherman had won an FLW® Tour tournament on Beaver Lake (another Ozark lake in northern Arkansas) immediately before ours, so that gave me some additional insight on how to fish. Tharp chose to fish structure known as “channel swings,” where a creek or river channel makes a turn, either near a shoreline or across a shallow flat. They’re always good starting points to fish on practically any lake because they offer bass both shallow and deep water adjacent to each other. Tharp chose channel swings in the backs of several creeks where he believed bass were moving in to spawn. These were pre-spawn bass that were also feeding heavily on both shad and crayfish. The first day of competition was held at Norfolk Lake, the next two at Bull Shoals, and the final day back on Norfolk. Tharp opened with 15-9, followed with 13-12 and 16-4 during the two days on Bull Shoals, and finished with 16-2 back on Norfolk. Another key to his success started the first day on Bull Shoals when he changed the weight of his jig. “I had been using a ½-ounce jig, but late in the afternoon there on Bull Shoals I noticed the bass becoming more aggressive,” says Tharp. “I started getting more bites, and when I’d reel in my jig, several fish would follow it. I did not want them to get a good look at the lure because I really wanted more of a reaction strike, so I changed to a 5/8-ounce jig. Even though Tharp had never fished either of the two impoundments before this tournament, he wasn’t concerned about fishing strange water. Whenever possible, he emphasizes, being able to fish with a favorite lure and technique, such as pitching a jig like he was able to do, provides a huge dose of confidence. He advises other fishermen facing similar situations to try to do the same. If nothing else, it’s just a good way to start fishing. This entry was posted in Bass Fishing, Tournament Fishing on May 24, 2016 by ronniegarrison. KVD: I had some spots where fish were as shallow as 15′ or as deep as 30′. One of the biggest fish I caught was on a 28′ hump. So, the big thing for me was zooming in and out when I got to these areas. On a 500-foot scale mapping with LakeMaster, you get a great view of everything that’s in the region – how the spot you’re looking at lays out and what’s surrounding it and how fish might funnel to it. But it’s also critical to zoom into the 50-foot scale so you can get the precise line and cast off the ends of these points, especially after I graphed them. Once I had that plot trail I’d use it as a line to make my cast. When they weren’t pulling water, the bass were setting up on or just outside points and ledges and hanging close to the bottom. The white bass were a lot higher up and farther off the drops. The largemouths would be one or two feet off the bottom and I could actually see them on my Humminbird, turn around, make a cast and catch ’em. And that’s what I found in practice and was able to expand on during the tournament. KVD: I like to fish crankbaits during post-spawn because I can be very efficient—not only can I cover a lot of water, I can tell the difference between hard and soft bottom. If I’m in 15′ to 20′, I’m going to throw a Strike King 6XD; if I’m in that 19′ to 24′, I like the 8XD; if I’m anywhere from 20′ to 30′ zone, the 10XD is the way to go, especially if you’re trying to target big fish on Toledo. The whole family of baits allows me to cover the 15′ to 30′ zone really well. I have a cranking system that I worked with Quantum to develop that includes 7′ 10″ or 7′ 11″ medium-heavy or heavy- action composite cranking rods and my signature 5.3:1 gear ratio reel for power. Depending on the crankbait, I use 12- to 17 lb. fluorocarbon. KVD: I reeled my crankbait down over a hump that topped out at 28′, and I got hung up in brush. As soon as I popped it free that fish bit it. I set the hook, loaded up, and I knew it was a big one. It immediately swam into a tree top, so I just kept pressure on it, eventually getting it to swim out of the tree. Once the fish was inside the boat I was so excited that I jerked the hook out of the fish and into my hand! I had the fish in one hand and had to cull a little pound and half fish and put that big one in the live well with a Strike King 10XD 2/O Mustad treble stuck in my hand. Fortunately, I had a camera guy pretty close and walked him through the procedure for the painless hook removal and it worked like a charm. This entry was posted in Bass Fishing, Tournament Fishing on May 21, 2016 by ronniegarrison. How Does Clark Wendlandt Breaks Down Tournament Waters? Tournament angling at its core is all about finding the biggest fish throughout the tournament waters to bring into the scales. Whether the tournament winning fish are two miles from takeoff or 40 miles from takeoff, there will always be anglers tracking them down and making the run to try and fill their livewells, no matter the risk. Anglers competing in the 2016 BoatUS Collegiate Bass Fishing Championship Presented by Cabela’s now have the opportunity to compete on over 70 miles of fishable tournament waters, stretching between Wilson and Pickwick Lakes. Just recently, Cabela’s and Garmin Pro, Clark Wendlandt, competed on this exact stretch and has some words of wisdom to offer the BoatUS Collegiate Bass Fishing Championship Presented by Cabela’s field of competitors. During the FLW event, Wendlandt chose to lock up to Wilson Lake during the tournament, but was unable to make it back to weigh in along with many other competitors, due to a barge taking precedent in the lock schedule at that time. In Wendlandt’s 28 year professional fishing career, not once has the angler been late or missed a weigh in, but on the Tennessee River, barges are the main priority, making the decision to lock up to Wilson Lake a risk. Choosing to lock to Wilson Lake is simply a risk versus reward scenario. Wendlandt was able to break down both lakes and explain the differences between the two to better provide anglers with information to make the decision to lock or not. Known for its miles of ledges, many anglers have found that summertime on Pickwick Lake can be an absolute slugfest. This summer, anglers might come back to an even more versatile Pickwick Lake due to the increase in vegetation. With the addition of Wilson Lake to the tournament waters, anglers will have the opportunity to experience ever more versatility. Though Wendlandt only spent one of his tournament days on Wilson Lake and the other on Pickwick, he believes that anglers should fish to what they are confident in, whether that is on Pickwick or Wilson Lake. Don’t miss out on your opportunity to compete in the longest running collegiate fishing tournament series championship ever! Sign up today and we’ll see you at the 2016 BoatUS Collegiate Bass Fishing Championship Presented by Cabela’s in Florence, Alabama. The Association of Collegiate Anglers, a division of Careco TV, is a sanctioning body developed to facilitate growth, development, and structure within competitive collegiate bass fishing. The ACA provides support to dozens of school operated regional events nationwide and owns the Cabela’s Collegiate Bass Fishing Series, the largest participatory collegiate tournament circuit in the country. With dedicated collegiate fishing programming on several television networks, three nationally televised collegiate bass fishing events, and thousands of members, the ACA is the leader in competitive collegiate bass fishing. For more information on the ACA, or the Cabela’s Collegiate Bass Fishing Series, visit www.CollegiateBassChampionship.com. For more information on Cabela’s visit www.Cabelas.com, for more information on CarecoTV, visit www.carecotv.com. This entry was posted in Bass Fishing, Tournament Fishing on May 19, 2016 by ronniegarrison. Last Saturday nine two-man teams fished a Potato Creek Bassmasters Buddy Tournament at West Point. I should say two-person teams. There were some wives fishing as well as children and grandkids. A club member could bring anyone they wanted as a partner. It was pretty day even if a little cool first thing that morning. In this tournament each team could weigh in their best five bass, so it was really a per boat limit. I think all nine teams weighed in a limit. We had prizes for the top three places and big fish. Jordan McDonald fished with me and, thanks to Jordan, we placed second with about 12.5 pounds and had big fish with a 5.87 pound largemouth Jordan landed at 2:00 PM. There were two other largemouth weighing over five pounds each weighed in, both by the first place team. They had five weighing over 14 pounds. Jordan and I started throwing topwater baits on a point and quickly caught three small spotted bass, big enough to keep but not really what we wanted. Jordan set the pace for the day, catching the biggest of the three. We fished shady banks until the sun got high and caught some more keeper spots but, again, not what we wanted. At about 10:00 we ran to a deep bank with two blown down trees on it. I caught a keeper largemouth on top over them but Jordan got a bigger one on a jig and pig, and lost two more good size fish. By noon we had about ten fish and we found some keeper spots on a roadbed but only one of them was big enough to cull one of our best five. I caught it on a jig head worm. With only an hour left to fish, at 2:00 PM, we decided to try the trees one more time. Almost as soon as we stopped Jordan set the hook on a big fish. I got the net and went to the back of the boat, but the way the fish fought, staying down deep, we thought it might be a catfish. And when it came under the boat down several feet deep I saw it and was sure it was a cat. I went back to the front of the boat to keep it from drifting into the trees. Suddenly Jordan yelled “its a bass!” The fish had come to the top where he could see it. I managed to get back there and net the 5.87 that was big fish for the day. I think Jordan caught either three or four of the five we weighed in that day. We had a lot of fun and could have kept over a dozen eating size spotted bass. That is a good plan if you want fish to eat. Go to West Point and catch spots to eat and let the largemouth go. Spots have about overrun the lake, but largemouth seem to be making something of a come-back there. A good many of the fish weighed in Saturday were largemouth. Spots are not native to Georgia waters and are not good for most of our lakes. Fishermen have “mid-night stocked” them in Jackson and Russell, and they have gotten into West Point, Bartletts Ferry and even Clarks Hill, maybe by illegal stocking but maybe from natural movement from upstream lakes where they were illegally stocked many years ago. Spots are fun to catch but they don’t grow as fast and don’t get as big as largemouth. Lanier is an exception with its deep clear water, standing timber and blueback herring, also stocked illegally. There they grow to quality size and fishermen think other lakes will be the same. In Alabama lakes, especially the Coosa River lakes, they are native and do grow to quality size. But conditions there are different. Fishermen may have hurt our lakes over the long term by messing with Mother Nature. So if you want some bass to eat go to a lake where spots are not native and keep a limit, ten per person, to eat. There is no size limit on them anywhere in Georgia except at Lanier so you can keep those 10 and 11 inch fish. They are a good eating size. Catch a bunch of spots to eat, have some good meals and fun catching them, and help the lakes at the same time. This entry was posted in Bass Fishing, Conservation on May 18, 2016 by ronniegarrison. This entry was posted in Bass Fishing, Tournament Fishing on May 17, 2016 by ronniegarrison.